Comfort & Style for Men. Of course there is a story behind this shoe! 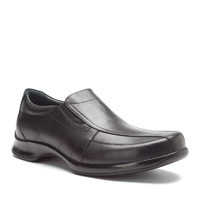 One of the Podiatry Students from Midwestern University School of Podiatric Medicine who has been shadowing me this month was wearing a lovely looking Echo dress shoe but I noticed that by the end of the day he was shifting around like his feet hurt. Although I recommended on several occasions for him to sit down and rest – he declined and continued standing for the entire day while we saw patients. Foot pain is a common problem for third year medical students because they spend the first two years of school sitting and in the third year they are thrown into hospitals and expected to stand for long hours on hard surfaces. I spent a month shadowing a Podiatrist and my feet and legs were killing me! At one point, I was so desperate I asked the doctor if I could sit during his patient exams and he refused to let me! He advised me it was more professional if I remained standing – even though he was sitting! I remember thinking that it was very odd that a Podiatrist – a person who has devoted his career to foot care – would refuse to let me sit and I promised myself that I would never do that to any students. He is an excellent student and I respect his tenacity but I hate to see him suffering. So, he’s had to listen to me talk biomechanics all day long to practically every patient for the past month and he showed up on Friday with the Dansko Theos. I am ashamed to say that I didn’t notice at first but one of the office staff (my mother!) admired his new shoes and we checked them and they proved to have excellent biomechanical control. and (yea!) he loved his new Danskos. He was surprised because he had spent significantly more money on the Echo dress shoes than on the Danskos but I reminded him that it is not how much money you spend – it is knowing what you are looking for in a shoe. forefoot sole on this particular shoe was thinner and far too flexible. The Dansko Theo has a thick, rigid sole that does not bend, which allows for much more biomechanical control and therefore – less pain. It also has a good insert with decent arch support (it can be removed to accommodate a custom-molded orthotic if needed) as well as a wide toebox and great rearfoot control. Echo is a wonderful shoe line and has many excellent shoes but, like every shoe line, it also has some stinkers. finding good looking comfortable shoes that are pathology specific! *Prominent “bumps” on the foot or an excessively high arch (Pes Cavus) – especially if you have an exostosis (bone spur) on the top of your midfoot area. This shoe may rub that area, which will cause irritation. for providing me with the information that allowed me to do the review on the Dansko Theo!